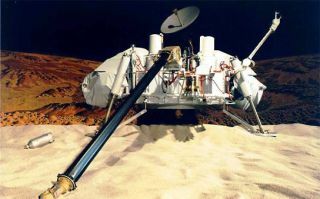 The Viking landers carried four instruments designed to search for signs of Martian life: a gas chromatograph/mass spectrometer, as well as experiments for gas exchange, labeled release, and pyrolytic release. The iguanas of the Galapagos Islands have evolved manyunique characteristics due to their isolation from mainland iguanas. Becausethey can't swim long distances, biologists believe that the first Galapagosiguanas arrived on natural rafts made from vegetation. The same thing may have happened across the ocean of space.Some researchers speculate that lifeon Mars ? if there is any ? may be composed of "island species"that were carried away from Earth on interplanetary meteorites. Or perhaps both planets were seededby life from an even more distant "mainland." "Earth may not be the center of the DNA-baseduniverse," says Gary Ruvkun, professor of genetics at Harvard MedicalSchool and Massachusetts General Hospital. The idea isn't too crazy. We already have evidence that somebiologically important molecules, such as the ingredients for amino acids, aredelivered by comets. And we know that around 3.5 billion years ago, meteoriteimpacts often kicked up rocks from the Earth's surface and launched them intospace. Microbes and/or bio-molecules may have hitched a ride on onethese cosmic "rafts." To test this theory ? called panspermia? Ruvkun and his colleagues have started a project called the Search forExtraterrestrial Genomes (SETG, as a play on SETI). They are putting togetheran instrument that could go to Mars and search soil or ice samples for thepresence of DNA. If the device finds any, it could then analyze the geneticcode to see if the "Martians" are related to us. A SETG prototype will have its first field test this year with funding from NASA's AstrobiologyScience and Technology Instrument Development program. Some argue that it is too soon to be thinking about DNA onMars. "If there were other signs of life, more specificallybiomass, I would applaud DNA analysis," says Norman Pace of the Universityof Colorado, Boulder. "Without even trace target biomass, talking aboutDNA sequences seems premature to me." But Ruvkun argues that his team's technique can detect asingle DNA molecule in a sample, whereas other tests for biology ? such asidentifying chemical constituents with mass spectrometry ? are not nearly assensitive. "It's very hard to detect a single molecule withchemical analysis," concurs Harry Noller from the University of Californiaat Santa Cruz. "But you can uniquely amplify DNA," so that its signalclearly stands out.? In order to amplify small traces of potential alien DNA,Ruvkun and his collaborators have looked for a stretch of DNA that would likelybe conserved in both Martians and Earthlings. They believe this common thread should be in the 16Sribosomal RNA gene, which is vital to the protein-making process in cells. Thisgene has regions of its sequence that have barely changed over billions ofyears of evolution. In fact, short segments in the 16S ribosomal RNA sequenceare exactly identical in more than 100,000 species that have so far had theirribosome genes analyzed. "There's no way to have a mutation here and live totell about it," says Noller, who is not part of the SETG team. As a consequence, any Martians that share our geneticheritage will presumably carry the 16S ribosomal RNA gene with the sameconserved pieces that all of us Earthlings have. The proposed strategy is for the SETG instrument to receivea Martian sample and add small extracts from the 16S ribosomal RNA gene as"primers" for DNA replication. If the sample contains DNA and if somepart of that DNA's genetic code matches the primer's, then a suite of chemicalreactions will produce a million or so copies of the sample's DNA. The amplified DNA can be detected with special markers andpart of its code can be sequenced in order to identify what sort of life-formis the owner of this DNA.?? If the sample were contaminated by Earthling DNA, then theSETG researchers should be able to recognize signatures in the sequenced codethat will pinpoint whether the contamination comes from a human or a bacteriaor something else familiar to us. But if nothing on Earth matches the observed sequence,Ruvkun and his colleagues will claim to have found our long-lost Martiancousins. Ruvkun and his colleagues have built a prototype of theirDNA analyzer and are in the midst of calibrating it. The team will travel toArgentina's Copahue Volcano, which is considered to be one of the mostMars-like environments on Earth. There, they will test whether the prototypecan sequence the DNA of some of the hearty microbes that live in the acidicrunoff from the volcano.